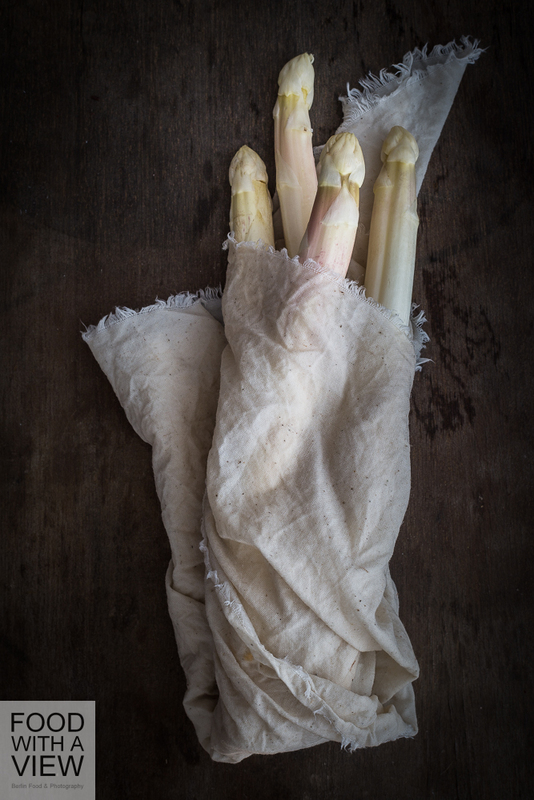 Over here, white asparagus will be fore sale only a few days longer – season ends on 24th of June. But this recipe works with green one as well that will most probably be available all July long. I have discovered this kind of „green“ smoothie only lately (ok, it’s more rosé ;-), and indeed, green smoothies in general and me have made friends just a couple of weeks ago. I can’t tell why, I just haven’t been so fond of these trendy drinks even though in the warm season, I often have some green salad & fruits for breakfast since. It’s so refreshing, and green smoothies are not that far away from that, just less solid… I changed from firm greens to liquid ones on the occasion of tooth pain which often appears at the beginnings of weekends, doesn’t it. Quite some time to spend until Monday morning, and I was like, now or never, let’s give the green fellows a try. Ever since, I mix and mix and mix – it makes so much fun, even more if you don’t force yourself to stick to recipes and just try out combinations of what you got in your fridge and in your fruit bowl. The rules are easy: you take half greens (and also some vegetables like fennel, cucumbers etc.) and half fresh fruits, and if you like your green smoothie really smooth, just add avocado or banana, it’s both gorgeous. Also take in some herbs and fresh juice, let’s say lemon, add some ginger (love it), or try some raw cocoa or even matcha – there are no restrictions for your phantasy. That’s how strawberries and asparagus came in. The two of them are a burner on the plate already, and in a smoothie, the pairing is even a bit more subtle. Raw asparagus is currently quite popular on the blogosphere, and I have to admit that of course I tried it as well but didn’t get things right obviously – I loved the fresh taste but couldn’t get used to the consistency. Well, no problem at all when it’s mixed up. Since this is a recipe with no animal products in it, I would like to make it a contribution to the project tierfreitag bei Austrian food blogger Katharine Seiser of esskultur. The term would translate to „animal Friday“ with a double meaning and the special twist of a wordplay. In German language, „free“ means „frei“ – like the syllabus in Freitag – so in this reading (which would translates to animal-free day), it’s a day of cookery with no animal products. The other reading would be the literal translation animal Friday, and this means posts that describe projects in farm animal keeping that go beyond usual requirements, also of organic certification in use. Thus it’s not a vegan day, but a day to think and write (and eat) with care regarding animals. Here we go! While green smoothies normally contain about ½ greens and ½ fruits, this one should be 2/3 asparagus and 1/3 strawberries – otherwise the latter will dominate the former too much. 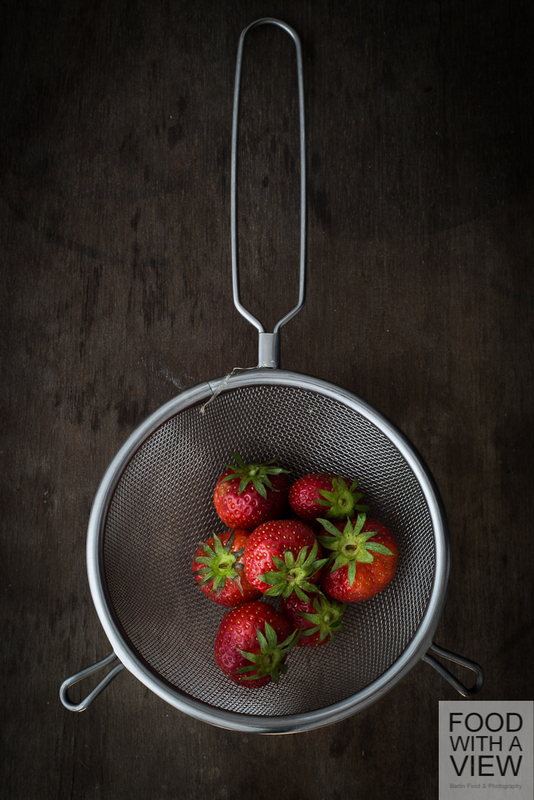 Put all ingredients into a mixer or use a tall mixing pot and a powerful handheld-blender. Mix very well starting with low power and then quickly switching to full power until everything is smooth and well emulated and fill into glasses. Have fun! Nur noch ein Wochenende lang (und genau genommen danach noch bis Dienstag) wird es weißen Spargel aus der Region geben, aber dieses Rezept funktioniert auch mit grünem, und den gibt es ja noch länger. Apropos grün: Grüne Smoothies haben mich bislang aus den verschiedensten Gründen nicht so richtig gelockt – bis mich kürzlich wochenendliches Zahnweh plagte. Bis zum Dentisten-Besuch am Montagmorgen habe ich auf Flüssignahrung gesetzt, ergo meine Sommer-Salate, die ich in der warmen Jahreszeit sogar zum Frühstück esse, einfach mal püriert. Das ist drei Wochen her, und seither vergeht kein Tag ohne grüne Smoothies – das wilde Zusammenstellen macht mir einfach zu viel Spaß. Für grüne Smoothies mixt man in etwa halb und halb Früchte einerseits sowie Blattgrün und anderes rohes Gemüse andererseits mit Wasser. Schön cremig wird’s mit Avocado und Banane, ein Muss sind bei mir entweder Ingwer und ausgepresste Zitrone oder Vanille und Dattel als Zugabe. Rohkakao oder Matcha sind auch prima Zutaten – und, wie ich feststellen konnte, auch roher Spargel und Erdbeeren. Von rohem Spargel liest man derzeit öfter mal, was ich sehr spannend finde. Aber irgend etwas habe ich beim Selbstversuch wohl falsch gemacht, denn ich konnte mich mit der Konsistenz bislang nicht so richtig anfreunden und muss wohl (und werde) nächstes Jahr weiter üben. Da ich aber Spargel und Erdbeeren grundsätzlich sehr gern zusammen mag, habe ich die beiden mal püriert – und mir ausnahmsweise mal eine meiner Smoothie-Rezepturen gemerkt. Da dieses Rezept köstlich ist ganz ohne tierische Produkte, möchte ich damit zum tierfreitag beitragen. Das ist eine Initiative der Food-Bloggerin Katharina Seiser von esskultur, die mir inzwischen auf mehreren Blogs begegnet ist (zum Beispiel hier und hier und hier) und die wir ebenfalls gern unterstützen möchten. Wer den tierfreitag noch nicht kennt: Dabei geht es um Rezepte ohne tierische Produkte oder um die Vorstellung von Projekten aus der Nutztierhaltung, die über die normalen gesetzlichen Anforderungen auch von derzeitigen Ökosiegeln hinausgehen. Damit ist der tierfreitag kein veganer Tag, sondern ein Tag, um auf mehreren Ebenen über den Respekt vor (Nutz-)Tieren nachzudenken, zu schreiben (und zu kochen). Und das finden wir prima. Alle Zutaten entweder im Standmixer oder mit dem – möglichst leistungsstarken – Pürierstab pürieren, bis alles cremig vermischt ist. Fertig! Ich liebe den Begriff auch nicht gerade von Herzen, die ie-Wörter haben alle so etwas Verniedlichendes. Aber Obst-Gemüse-Mixgetränk klingt so nach Landwirtschafts-Messe und ein Shake enthält Milchprodukte – gar nicht so einfach also mit der wohlklingenden Namensgebung ;-). Bei den Erdbeeren muss man tatsächlich aufpassen, daher nur ein Drittel Obst statt wie sonst bei grünen Smoothies die Hälfte. Ye, Deena, you can taste the asparagus if you have 2/3 of it in the smoothie. It’s subtle though – that’s the way I like it best, but of course you can take even more of it in to have a stronger asparagus taste. Thank you, Laura! The idea is kind of funny, isn’t it ;-). It came to my mind because you find raw asparagus in many recipes on blogs these days and I didn’t like the consistency that much, when I tried it, but I loved the raw taste. Since they share some taste characteristics with Belgian endive which are quite common in green smoothies, I was like: why not have an asparagus drink ;-). You’re absoltely right, green ones will surely be great, too, and even more intense. Love green asparagus as well (and didn’t know that there’s no white one in Australia). Have a nice autumn week-end! Wow, this is unusual! I’ve never eaten raw asparagus, and this is the first time I see it in a smoothie. And with strawberries! It’s the first I hear of poppy seed oil as well! What other uses does it have? Is the taste strong or subtle? I do love weird combinations in smoothies, they often turn out quite delicious! Like you, I often add lemon juice and fresh ginger, it is a great way of packing tons of nutrients into one “drink”. You are so right, Darya, smoothies are a great way to have many healthy things in just one place. The taste of raw asparagus is quite appealing, a little like Belgian endive, but more subtle – not so far away from the cooked version, but very fresh and with a bit more bitterness. I discovered poppy seeds oil only a year ago or so in an organic shop, it’s from a French company called Bio Planète (http://www.bioplanete.com). The taste is somewhere between subtle and intense – it depends totally on the combination if it tastes through a lot. It’s great with asparagus dishes, or with mozzarella and as a topping for eggs in jars. It gets more intense when warmed up very carefully or on warm dishes, at least that’s my experience so far. Hi Claudia! 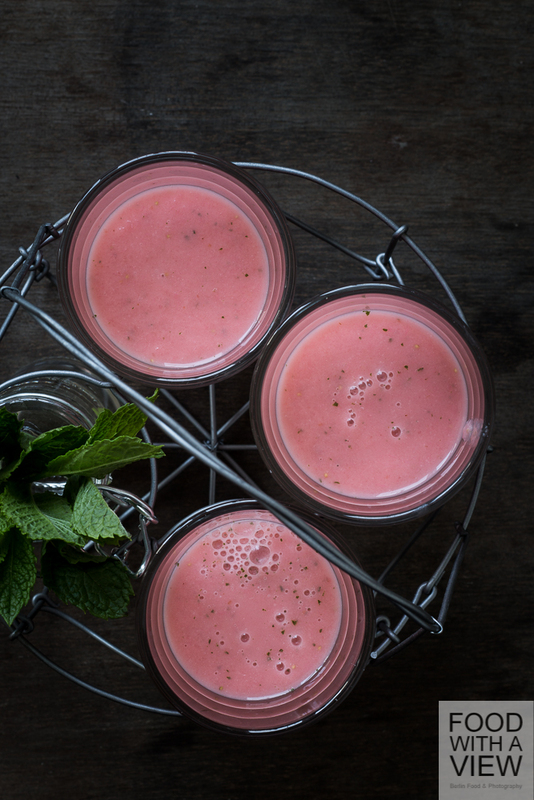 Your rose smoothie is so beautiful! I’ve never thought of combining asparagus with strawberries but am really intrigued! Your pictures, as always, are stunning! Thanks a lot, Puja! Asparagus and strawberries are a great match also apart from smoothies, like strawberry vinaigrette with steamed asparagus. Oh my goodness! What a gorgeous smoothie. I’ve never tried adding asparagus to my smoothies before but now I must try! Beautiful beautiful! Thanks a lot! I hope you will like the taste if you give it a try. Ein Tränchen für den letzten Spargel und ein Hurrah für diese tolle Idee, liebe Claudia! Den Spargel-Smoothie habe ich den grünen Smoothies nachempfunden, die ja alle Grünzeug und Gemüse mit Früchten mixen. Wirklich süß sind die dadurch eigentlich nicht, eher fruchtig, und die kleine Zuckerportion hebt eher den Geschmack, als dass sie süßt, ähnlich wie beim Zufügen von Zucker zum Spargel-Kochwasser.